Comfort! This has to be the first thing you look for. I know that you many think that the stool you saw for twenty bucks downtown will get the job done. But the fact of the matter is, looking at the stars should be something that is fun and relaxing. You cannot relax if you have to keep shuffling around trying to get comfortable. Another thing that you want to make sure you look for is that the chair can be folded up. You do not want your chair taking up a lot of space when you are not using it so make sure it can be folded up so it can be put away easily. Being adjustable is something else you want to look for. You want a chair that is going to let you play around with it a little bit so you can make sure it is at the perfect height for you. This Vestil chair we are looking at is the lowest priced one on this list and at first glance it does tick all the boxes for what you would want in a good adjustable astronomy observing chair. The seat can be adjusted from 18 inches all the way up to 33 inches so it going to be very easy for you to adjust it so that you are nice and comfortable. It can take up to 300 pounds and when you are not using it, it can be folded up flat and stored away somewhere out of the way. Now this does offer many things that you would want from a chair, but the padding is a little on the thin side. I used this for a couple of hours and did not find any major discomfort, but in comparison to the other chairs on this list, the padding is a little thin. 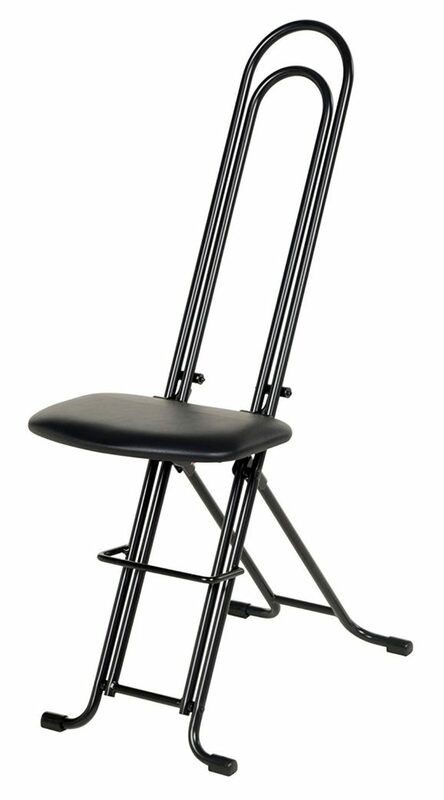 The way you adjust the height on the chair is very simple and required pretty much no effort at all, but just make sure that you do not use too much force (like I did) as it feels like you could bend something pretty easily. Which is actually quite surprising as the chair had a strong feel overall apart from this. The first thing that caught my eye with Company Seven’s adjustable astronomy observing chair was just how nice, thick and chunky the actual seat looks. I can tell you that the padding they have used in here is just first rate and I have it on good authority that it is pretty much rot and decay proof! 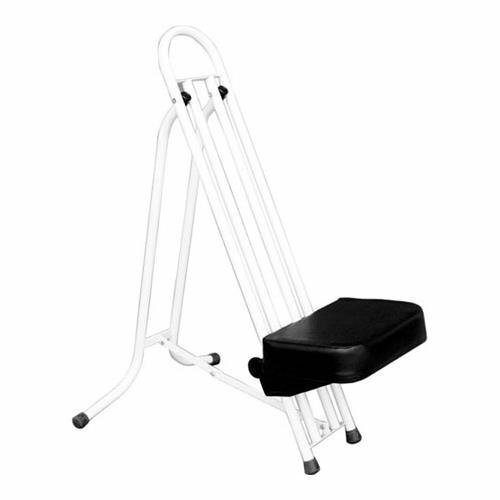 The chair can be adjusted from a very tiny 9 inches all the way to 31 inches so there should be an ideal comfort height for anyone who uses this. I really like how thick the frame is for this chair and I got the impression when I was using it that it would last for a very long time. 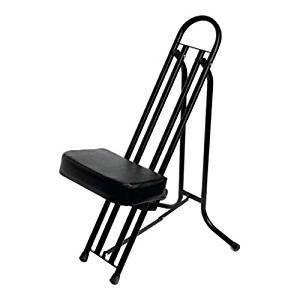 When not in use, you can fold the chair up which makes storing it very simple. The only little criticism I have of the chair is that when I was sitting on it there could have been a little bit of padding added to the very top. This is because I like to sit low and I was resting my head on the metal from time to time. To be fair though this is more of an issue with the way I used the chair than the actual design of the chair itself. It is a little pricier than the Vestil, but I feel that it is worth the extra 20 to 30 bucks as it is more comfortable. Also the jet black look of this chair is very cool. It looks like something James Bond would sit on! 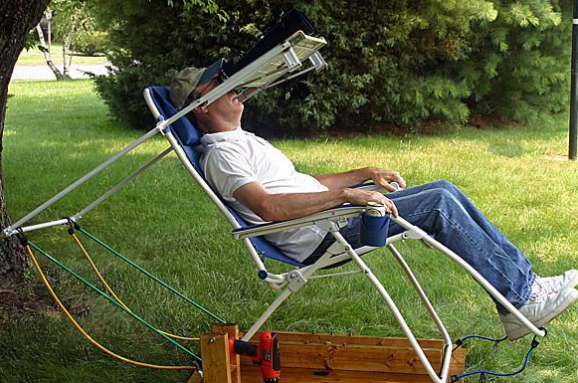 The Starbound Astronomy chair that we are looking at made me do more than a few double takes. You see this is pretty much the exact same chair as the one we just looked at. It offers the same features that I really liked. This includes that nice and thick padding that really does make sitting on it for a few hours a painless experience. It also can be folded away so storing it is easy, so you will not be getting into trouble from your other half for your chair still being left out! This chair also is made with the same kind of chunky steel that the one before is so it has a very long lasting and robust feel to it. So if this is exactly the same as the one we just looked at what is the point? Well this one here is actually finished in white. Now at first I thought this was really cool, but white shows up mud and dirt much easier than black. So if you do your star gazing on the grass or even in a field then this thing will get filthy pretty quickly and need a good cleaning. Is this that big a deal? Well not really, but the dirt will not show up as much on the black one so I felt I had to mention it. So What One Is Best? Picking the best adjustable astronomy chair out of these three was actually pretty easy for me. In all honesty I have very little to grumble about with the Vestil. But the best one out of the three I used was the Company Seven StarBound Astronomy Viewing Chair. It may have offered the same comfort level as the Starbound Astronomy Viewing Chair, but it came down to the fact that I felt the black design would be less maintenance than the white. If you prefer the cool look of the white and do not mind having to give it a clean then by all means go for it. For me though I will be doing my star gazing while sitting on the Company Seven StarBound Astronomy Viewing Chair.